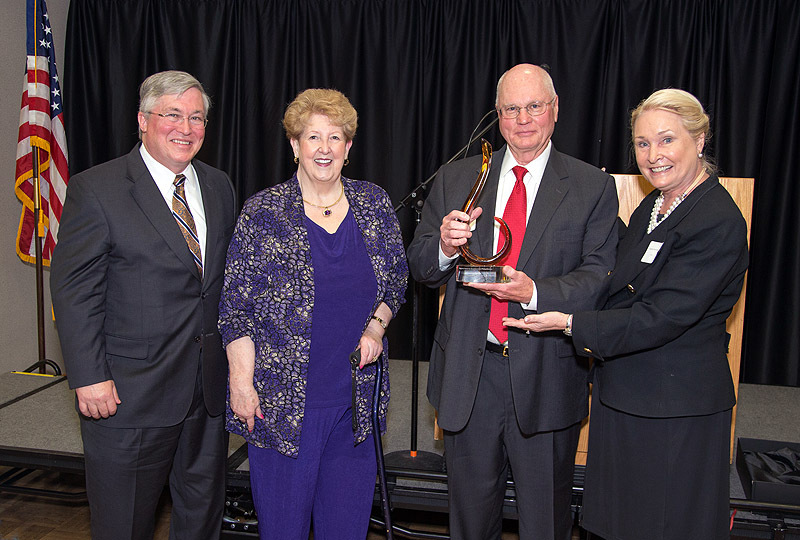 Clarksville, TN – The Tennessee Board of Regents recognized the generosity of two longtime Austin Peay State University supporters on April 23rd by presenting Ken and Amy Landrum with the 2013 Regents Award for Excellence in Philanthropy. The Landrums, both 1964 graduates, moved to Florida after Amy retired from a 30-year teaching career and Ken retired from a 32-year career with the National Life and Accident Insurance Co., but their philanthropic personalities have kept them close in spirit to APSU. APSU President Tim Hall joins Amy and Ken Landrum as Fran Marcum with the Tennessee Board of Regents presents the couple with the 2013 Regents Award for Excellence in Philanthropy. (Photo by Beth Liggett/APSU).